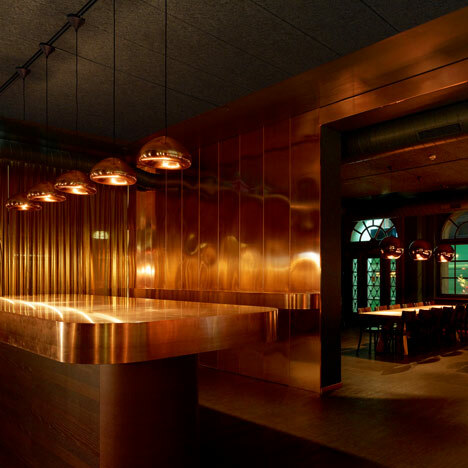 Swiss architect Aurélie Blanchard has lined every wall and surface in the bar of this Basel restaurant with copper, while a dark green dining room looms just behind. The green walls of this room were inspired by the colours of painted doors throughout the city and are subtly highlighted by a series of wall-mounted light bulbs. Spherical copper pendant lamps are suspended above a row of long oak tables, where diners sit in large groups. In the bar, slightly flatter lamps illuminate a table and bar at standing height, both of which have chamfered edges. Other dark restaurants worth a look include one with a chandelier made from jam jars and another with a fanning timber canopy. Photography is by Mark Niedermann. Situated in the heart of Kleinbasel, UNION restaurant is a new hotspot of this multicultural neighbourhood where immigrants, expats, students and creative industries coexist. Jérome Beurret and Stefan Grieder, owners of the well-known Rhyschaenzli in Basel, along with their new partner Pascal Salathe, appointed the architect Aurélie Blanchard to design their new restaurant. The architecture aims to capture the spirit of a traditional American kitchen with fine Eastern influences. At UNION rustic meals such as burgers and ribs are revisited with contemporary touches. The design intends to create a warm dining environment with a vibrant metropolitan bar for both evening and daytime. The dark green dining room with its oversized oak tables engages with the street whilst the dark envelope creates an intimate environment despite the room’s size. Basel’s traditional painted wooden doors inspired the room’s colour. Copper globes suspended above the tables cast warm islands of light between the diners who sit in clusters around these large communal dining tables. Domestic bliss of home-cooked meals and candle-lit dining atmosphere finally tie the room together. The bar in contrast is a precious copper niche that opens onto the dark green dining room at the back. Shelves and standing tables emerge from the copper walls; masking the room surfaces with a seamless copper coat. The oversized standing table and new bar are an extension of the wooden floor, finished with a thick copper plate. Rounded corners, solid copper elements and cast glass lamps evoke metropolitan industrial times. Throughout the space, a dark wooden floor unifies the restaurant and bar. Touches of copper jump into the green room through the folded bar, globe lamps and vintage copper vases. Next to the bar, the existing courtyard is a lush and fresh space where the green of the plants echoes the Basel green of the restaurant.